The beautiful blue pools and impressive boiling fountains along Hot Creek in east-central California have provided enjoyment to generations of visitors, but they have also been the cause of injury or death to some who disregarded warnings and fences. The springs and geysers in the stream bed and along its banks change location, temperature, and flow rates frequently and unpredictably. 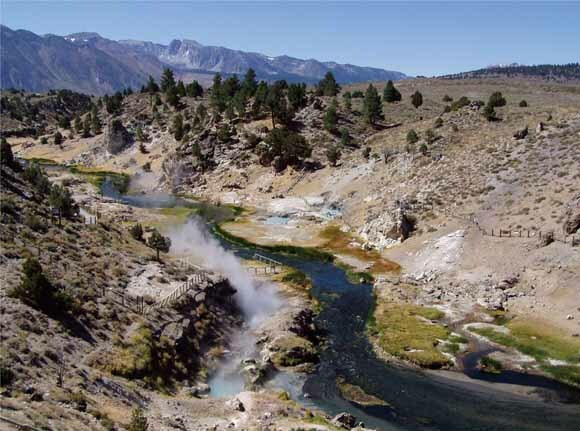 The hot springs and geysers of Hot Creek are visible signs of dynamic geologic processes in this volcanic region, where underground heat drives thermal spring activity. Press-quality illustrations, original artwork you may use (CMYK). | Volcano Hazards Program | Water Resources of the Western U.S.